Alas we've not had much of a summer for al fresco dining. I've still managed to get some barbecuing done however unfortunately not quite as often as I would have liked. 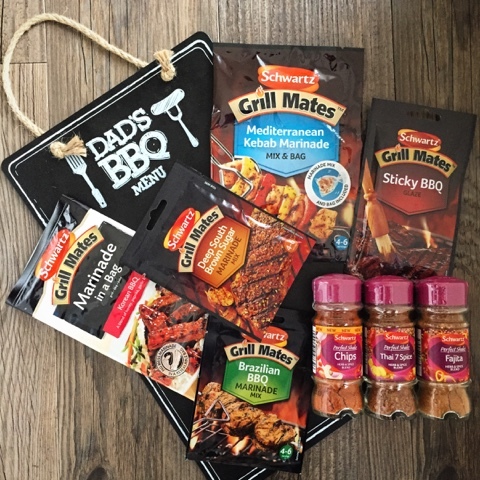 Hopefully September will bring us an Indian Summer but even if it doesn't a range of Grill Mates BBQ marinade mixes from Schwartz mean you can enjoy the flavour of BBQ in the comfort (and warmth!) of your kitchen all year round. 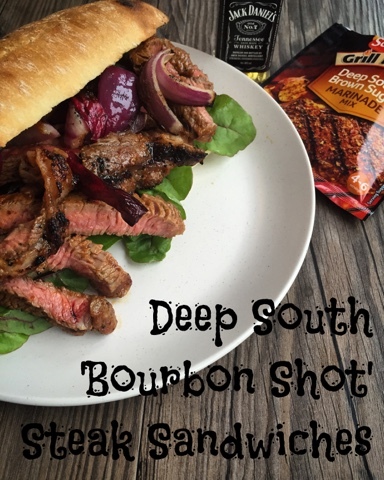 To try the range out I used their Deep South Brown Sugar Marinade Mix to whip up a couple of Deep South 'Bourbon Shot' Steak Sandwiches. These were so quick and easy to make and even with only 15 minutes of marinading had an amazing smoky deep south flavour. The Tennessee Whisky gave it a lovely kick and as its not something I had to hand in my drinks cupboard I purchased a miniature for £3. 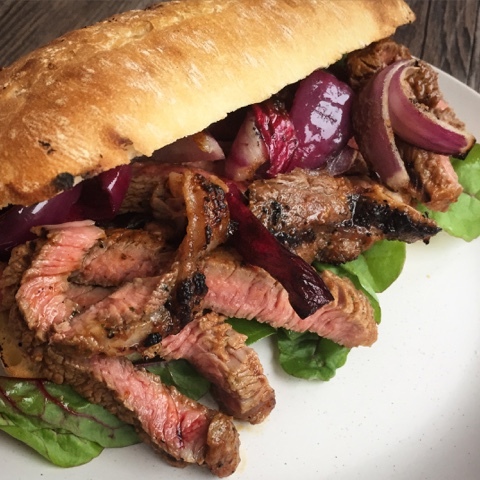 The weather played ball and I cooked my steak, onions and ciabatta on the BBQ but this would work equally well on a griddle pan or under the grill. 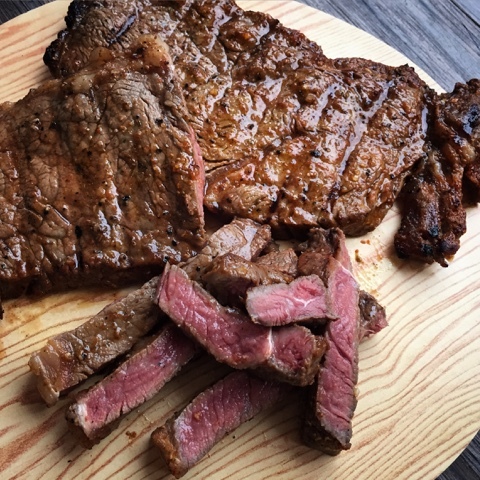 I like my steak rare but if pink isn't your thing feel free to cook to your own preference. 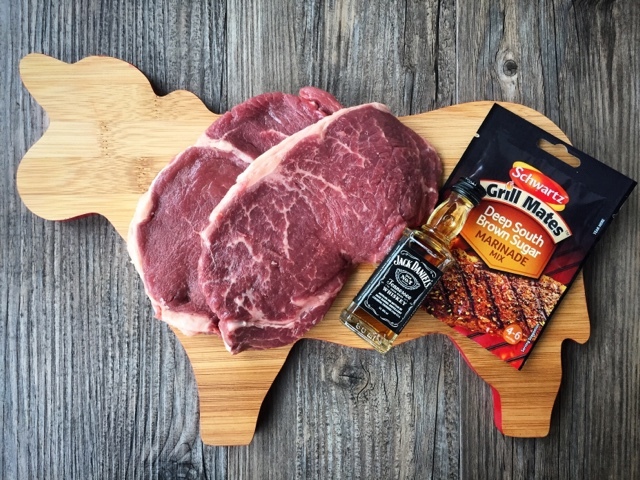 I halved the quantities of marinade to serve two and have saved the remainder for a taste of the deep south on another occasion. Disclosure - This is a sponsored post for Schwartz. All views expressed are my own. Wow, this looks incredible! 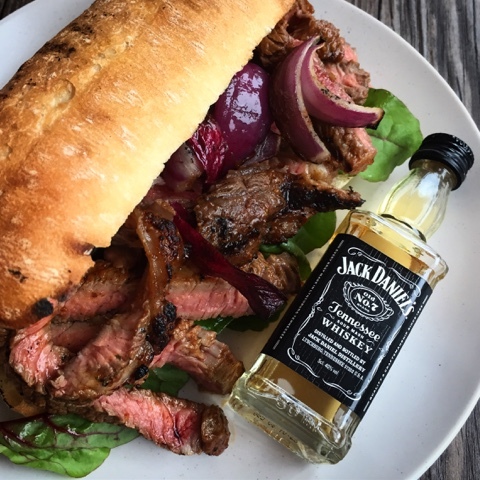 Everything is improved with bourbon and steak too?! Mmm! I'm not a Bourbon drinker, hence none in my drinks cabinet, but it worked amazingly well in this! Oh dear, I had a veggie drooling at one of my posts the other day! I'm sure you could use the same marinade on vegetable kebabs. This is my idea of heaven! I really need to make this as soon as possible! It was amazingly good and could be eeked out to feed more by adding more bulk to the salad. I'm thinking tomatoes and avocado. Thanks Emily! Someone did say on Instagram that the photos made them want to lick their iPhone. 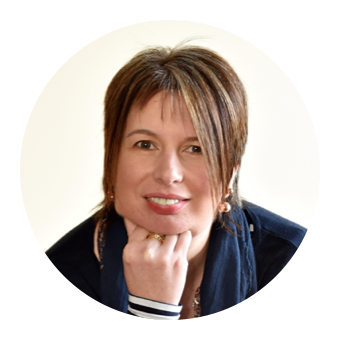 Are you talking about yourself? Whomever it is I hope they enjoy it as much as I did. Love miniature bottles of booze, they always make me think of Christmas. Especially whisky, which was always in my Grandad's stocking. He wasn't much of a drinker, but he always polished it off before breakfast. And yes ALL of our family gets stockings! I have a bit of a thing about miniature bottle of booze too and have rather a collection of mini gins! You know what I've been craving lately? ...This. This sounds so incredibly delicious! It was so good! I've just used the other half of the packet on duck fillets and they were also amazing.